It's nice when the world chooses to accommodate your family -- it's a bit Truman Show-esque, but you'll take it. 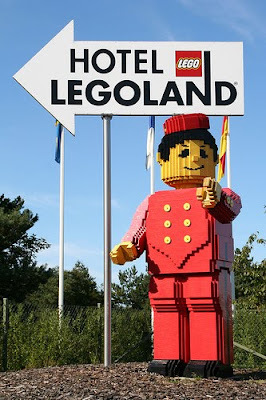 LEGOLAND California just received approval to build a hotel adjacent to the theme park in Carlsbad, California. Construction is expected to take 18 months, but the project is not likely to move forward until the economy picks up slightly. So that means around the time my daughter is in the middle of LEGOLAND's stated demographic of two to 12 years old, the hotel should be ready to open. Not too shabby. Kate and I stayed at the LEGOLAND Hotel in Billund, which is bursting at the seams with LEGO bricks and attached to the park via an elevated walkway. It featured free kiosks with LEGO Star Wars and LEGO Indiana Jones video games, circular pits piled high with LEGO pieces and surrounded with cushions to build on, and you walked on LEGO-patterned carpet beneath LEGO-filled acrylic lamps as a LEGO mosaic of Mona Lisa hung on the walls. It was kind of like the average adult fan of LEGO home. So, here's to another LEGO construction project, it's just a bit bigger than the buildings that most of us are trying to tackle right now.